One of the most disconcerting experiences a plasterer can have is when he does what seems to be a perfectly good job of plastering a pool, only to be called back out to find that the plaster had developed calcium nodules, or small buildups of calcium carbonate on the pool surface. 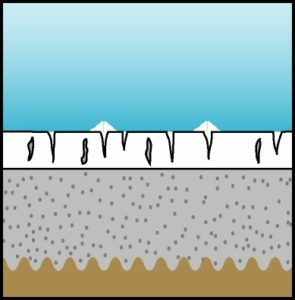 Although some have attempted to associate nodules with aggressive pool water, research has shown that the cause of nodule formation is cracking (from over–drying of the plaster) or bond failure (aka delamination), which occurs primarily in replastered pools. Nodules, of course, have nothing to do with pool water chemical balance. 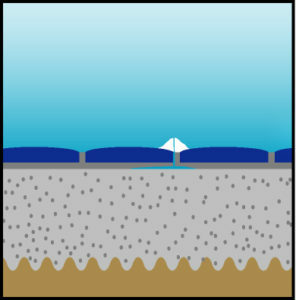 In order to understand the process of nodule formation it can be helpful to consider what happens when you first fill a plaster pool with balanced water. As the plaster hydrates (cures) chemical reactions take place which result in the release of soluble calcium into the pool water. This calcium, in the form of calcium hydroxide (Ca(OH)2), has a very high pH, which in turn raises the pH of the entire body of water in the pool. The soluble calcium hydroxide reacts with bicarbonate (HCO3– … part of the pool’s alkalinity …) in the water and converts to a non–soluble form called calcium carbonate (CaCO3), which is precipitated throughout the pool in a powder commonly referred to as plaster dust (see chemical reactions sidebar). The plaster dust is brushed and filtered, removing it from the pool. Calcium that still resides in the water once normal pH levels are achieved tends to be calcium bicarbonate (Ca(HCO3)2), another soluble form of calcium. Remember that in this context “soluble” means that it will dissolve even in balanced pool water. Hollows in the Plaster – In spite of the best care a plasterer may take, there are times when cavities or voids are present in the plaster. These voids may be the result of hollows between fixtures and plaster, or the lack of a good bond between the plaster and the underlying base material. (This lack of bond is referred to as delamination or bond failure). Delaminated areas can be small (2–3 inches in diameter) or very large (3­–4 feet or more). If the void is never exposed to water, the sequence for creating a nodule stops. 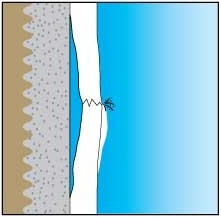 If, however, water can enter the void through a connecting path (usually either a crack or pinhole, depending on the shape of the delamination and the nature of the flexural force involved), the sequence continues. Depending on when the path is opened, voids in plaster may become filled with water as soon as the pool is filled, or they may not fill with water until months or years have passed. 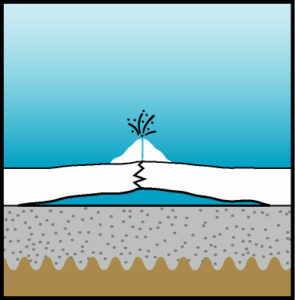 Voids may even develop after time, if delamination occurs due to ground shifting or other extraneous forces. Regardless of whether the void is filled with water immediately or down the road, the process of hydration will occur inside the void just as it did out on the face of the pool when it was new. Only this time the calcium hydroxide is temporarily trapped, allowing it to concentrate – creating a strong, localized body of the material from which a nodule can be made. But it then travels out to the main body of water in the pool where it can react with alkalinity to transform into calcium carbonate. Where does this conversion to non–soluble calcium occur? In our plaster dust example, the conversion occurred uniformly over the entire surface of the plaster, resulting in a uniform fall–out of plaster dust throughout the pool. In the case of super–saturated calcium water oozing out of a pinhole, the conversion occurs just as it exits the void and enters the pool, i.e. : on the plaster surface of the pool. How Fast Does It Squirt Out? – The answer to that question seems to determine whether or not a nodule forms. If the supersaturated water squirts out fast enough, a small amount of plaster dust will form beyond the exit hole, and will disperse into the pool water. This amount is little enough that it is not noticeable. If it oozes out very slowly, it may even solidify in the hole and plug it up. If the speed is just right (or wrong…), it will form a nodule around the exit hole. They usually range from 1/4th to 1/2 an inch in diameter, the size of these nodules dictated by the size of the delamination area, and thus how much calcium is available to form the node. Void Nodules: 1. Under normal conditions, the plaster (white) is bonded to the gunite substrate (speckled), which in turn rests on dirt (tan). 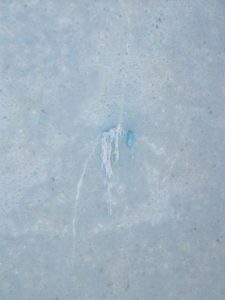 Calcium hydroxide bleed-off from the plaster surface dilutes into the pool water (blue) and is converted to both non–soluble calcium carbonate (plaster dust) and soluble calcium bicarbonate. 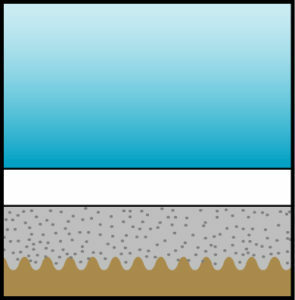 Continuous “rinsing” of the hydroxide bleed-off by the circulating pool water, as well as normal pool maintenance (such as brushing), prevents a buildup of high pH material on the plaster surface. 2. 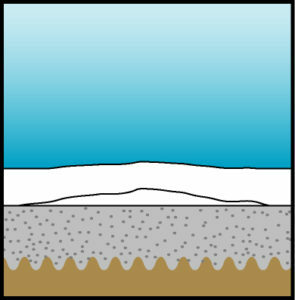 Sometimes, an air cavity can be formed between the gunite and the plaster. This is referred to as “delamination” and the cavity is referred to as a “void.” As long as the void is not connected to the surface of the plaster, the fact that the void even exists may not be known. Unless the plaster completely breaks free from the surrounding plaster, creating what is referred to as a “pop–off,” or unless the delamination is extensive, this is not considered by the plaster industry to be a defect. 3. 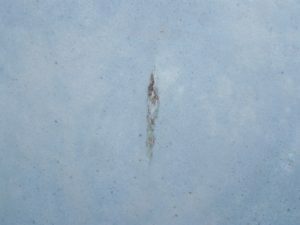 In some cases, however, the void is connected to the surface by a small pinhole or hairline crack. 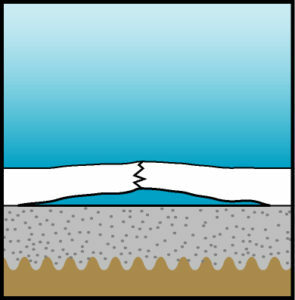 Pinholes and cracks are created from structural flexing of the delaminated plaster. The type and size of resulting hole or crack is dependent on numerous factors, including the size and shape of the delamination, the nature of the structural flex, the strength and thickness of the plaster over the delaminated section, etc. 4. Gradually, water from the pool penetrates the void via the hole or crack, and creates a localized chemistry environment completely separate from the water balance in the pool. As calcium hydroxide bleeds into the void water it creates a calcium–rich, high pH solution like a little “calcium/pH factory” beneath the plaster surface. The pinhole or crack is not of sufficient size to create a rinsing effect like that going on at the plaster surface. 5. Calcium–rich void water and bicarbonate–rich pool water, in contact with each other at the plaster surface, react with each other and seek equilibrium, which results in the production of an insoluble calcium carbonate by-product. 6. If the conditions are right, this insoluble calcium carbonate can build up a “slag pile” around the exit point, thus forming a nodule. Although the size of a nodule is mostly a function of the available calcium reactants in a void or crack, the shape of a nodule is dictated by environmental forces. When they form on horizontal surfaces, the nodules tend to be round and “volcano” in shape. But of they form on a vertical surface, they may be in a drip, or stalagtite shape. 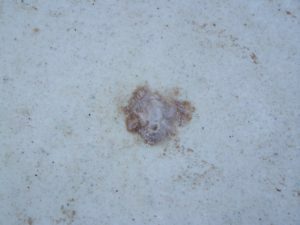 A nodule is white (even on colored plaster pools!) since the material forming the plaster is calcium, not the pigment in the plaster. However, because of the porous crystaline texture of a nodule, it will absorb impurities. It is therefore not uncommon to see nodules aquire a grey color over time. Nodules that absorb other elements may turn other colors, such as with nodules that absorb copper and turn turquoise. 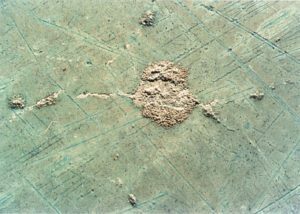 Crazing in the Plaster – When new plaster is subjected to excessive drying, such as from very windy, hot, or dry days, or from over-use of set accelerators, excessive shrinkage cracks may form in a plaster surface. These cracks are referred to as shrinkage cracks, spider-webbing, or crazing, etc. If conditions are right, such as the width of the crack and the ability of just the right amount of water flow through the crack system, nodules may form at the plaster surface along these cracks. They tend to be much smaller than delamination nodules. 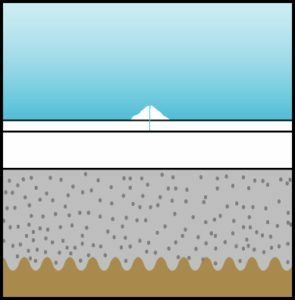 Fiberglass Nodules – Nodules may form on fiberglass pools – those where fiberglass has been applied over a gunite, plaster or other cement-based surface. 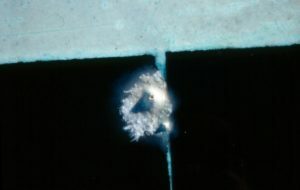 These nodules have been found to be the same as delamination nodules – however the crack, hole or imperfection is in the fiberglass, allowing pool water to get behind the fiberglass and to the cement paste. The same reactions then take place, and the calcium-rich solute is carbonated as it re-enters the pool through the fiberglass imperfection. Tile Nodules – Nodules also may form in grout lines between tiles. 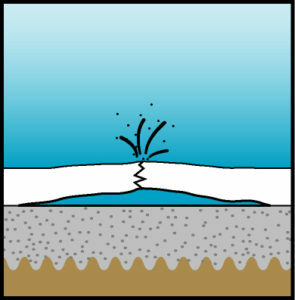 Again, the same basic chemical reaction is taking place, but the water is entering through a crack between grout and tile, and drawing calcium from void surfaces in the substrate underneath. It is instructive to consider the case of pools that have been acid washed or subjected to the acid start-up procedure. These pools often have had enough muriatic acid added to expose the plaster to a pH of 4.5 and alkalinity level of 0 for over a week. 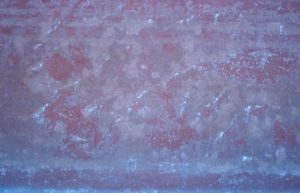 In both cases, the plaster has a better appearance afterwards than before, yet the resultant surfaces do not have any greater propensity towards nodules following the acid wash. Surface preparation and compatibility of new coatings to existing surfaces is crucial to many other applications besides pool plaster. Anyone who has spent hours or days removing old varnish from furniture or old paint from the eaves of your house prior to repainting is familiar with the concept. Those who are even more familiar with surface preparation are those who have failed to properly prepare the surface, or to ensure compatibility of a new paint with the old. Bonding plaster to fresh gunite is rarely a problem because there is a chemical bond (where curing plaster chemically “locks on” to curing gunite) in addition to a mechanical bond (where the fresh plaster fills in the intentionally rough surface of the fresh gunite). The “new plaster to old plaster” and the “new plaster to old gunite” combinations are much more difficult. This is because in these situations no chemical bonding is likely, due to the fact that the old plaster or gunite is already thoroughly cured or hydrated. This fact has given birth to companies manufacturing, distributing, and instructing plasterers on the use of additional chemical bonding agents. If there is not an excessive number of nodules, our experience is that the best way to treat a nodule is to let it exhaust itself normally. Just as plaster dust formation stops when the normal amount of calcium cures out of the surface, a nodule will cease growing when a proportional amount of calcium cures out of the void. A nodule can be scraped or sanded from the surface, and will only continue to reappear until all of the calcium from the source has been exhausted. Sometimes one removal will suffice, and other times it takes 2, 3, or more removals. The number of times it regrows and the size of the growth can be an indication of the amount of plaster surface inside the void. What If There Are Too Many? There comes a point when there are just too many nodules in certain pools, and more drastic action must be taken. These (rare) cases are usually the result of excessive cracking of the surface, or of extensive bond failure in the pool. When this happens the nodules are actually an indication of much more serious problems that would justify replastering the pool. One of the biggest stumbling blocks in the industry today is the fingerpointing that is done in trying to assign blame. The fact of the matter is that, like many other phenomena that are common in cement applications, nodules are not always preventable. Good technique on the part of the plasterer, along with sound bonding principles will eliminate the vast majority of nodules, yet the appearance of a few is not unexpected (especially on replaster jobs) and are easily dealt with.